Worldwide Cash Club Review: Does It Work Or Is It A SCAM? Infinity Scalper Review : Does It Really Work? Mining Max Review : Does It Work Or Is It A SCAM? Hey, friend – Jason Foster here, and thank you SO much for stopping by to check out my FULL Mining Max Review! In recent months, Mining Max has generated a lot of buzz online. Mining Max is a cryptocurrency company that deals with bitcoin mining and promises members will get continuous profit. You might have come across one of their associates pitching to people on social media about the business opportunity. The question that everyone is asking is whether this company is a legit business or a scam? 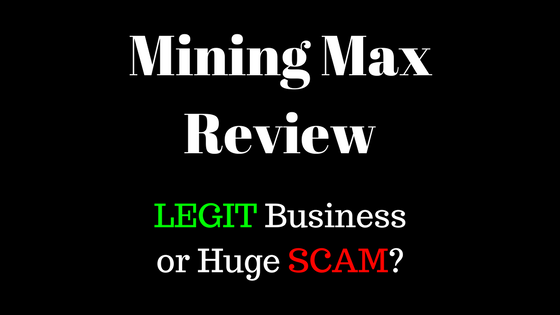 When you check online, you will see mixed reviews on the Mining Max company. Some people are saying the company is a scam while others claim it is legit. Perhaps you are here because you want to learn more about the Mining Max company. Before joining any Multi Level Marketing company, it is important that you do your research about the company. The good news is that I have gathered all the facts and information about Mining Max company. These facts includes the company’s owners, products and the compensation plan so that you can make an informed decision on whether to join their business or not. What exactly is Mining Max? After checking the Mining Max website, I was disappointed to find that the company does not provide any information regarding who owns or runs the company. This is a crucial detail which many people want to know before investing their money to join an MLM company. 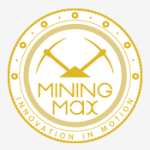 However, upon further research I discovered that the Mining Max website has a domain name “miningmax.net” which was privately registered on September 1, 2016. I was able to come across a YouTube video with the title “Mining Max Introduction” which reveals Daniel Park as the Chairman and Founder of the company. Unfortunately, there is no any other information regarding Mr. Park online. Going back to Mining Max review, their website includes a Nevada incorporation number, although it shows that the company has an address in California. However, it remains unclear whether the company has a physical office in California or not. On top of the website you will find different language including Chinese, Korean, Japanese and English. According to Alexa, 66% of Mining Max website traffic comes from South Korea, making Korean the most prominent language on the site. That is fishy considering the company address is in the US. I was able to find a marketing presentation by Mining Max which states the company utilizes an ”internet data center”or IDC that is located in Seoul, South Korea. What about Mining Max products? Mining Max company has no goods or services which it retails to customers. Therefore, don’t expect to earn retail profits like other MLM companies when you join Mining Max as an affiliate member. The only thing that affiliates get to market is the company’s affiliate membership. The company shows on its website that it has a mining machine dubbed MM-ALT-401-E/Z which promises to provide high efficiency, low power consumption and high performance. That’s all the information they have regarding their products. When you join this company as an affiliate, you will require to pay $3,200 so that you can earn a daily ROI that will be paid for the next 2 years. If you manage to sponsor a new affiliate into the business, and they pay $3,200, you will earn a referral commission of $200. Mining Max pays affiliates residual commissions based on a binary payment structure. Affiliates who sign up and join the company are placed at the top of a binary team, which has two sides, the left and right side. The first level of the binary team has two positions while the second level is split into further two to make four positions. Positions in the binary team can be filled directly or indirectly by you. At the end of the day, Mining Max will add up the $3,200 investments affiliates contribute on both sides and you will be paid $140 as per $3,200 contributed. The amount of money affiliates can earn each day depends on the investment they make. · If you invest $3,200 you will earn $500 maximum per day. · If you invest $9,600 you will earn $1,500 maximum per day. · If you invest $16,000 you will earn $3,000 maximum per day. · If you invest $22,400 you will earn $5,000 maximum per day. · If you invest $32,000 you will earn $10,000 maximum per day. Matched investments of $3200 are taken from both sides of the binary team, while unmatched amounts are carried over to the strong side of the binary team. Affiliates are paid a matching bonus based on their downline binary commission. The matching bonus is paid via a uni-level payment structure. That means as an affiliate, you will be placed at the top of the uni-level team. Every affiliate that you sponsor into the business goes below you to level 1. New affiliates who are sponsored by level 1 affiliates will be placed in level 2. And if level 2 affiliates sponsor new affiliates they will go to level 3. This will continue up to level 10, with a 5% matching bonus paid through all levels. The amount you are paid depends on the amount you invested. · If you invest $9,600 you will gain a 5% matching bonus in four levels. · If you invest $16,000 you will gain a 5% matching bonus in six levels. · If you invest $22,400 you will gain a 5% matching bonus in eight levels. · If you invest $32,000 you will gain a 5% matching bonus in ten levels. This company claims that their ROI are produced by Ether Mining, while 7% mining output reserve are saved for mining bonus. The mining bonus is paid 20 levels via a uni-level payment structure. If you want to qualify for the mining bonus, you will be required to invest $9,600. Affiliates can earn additional mining bonus by generating two more positions in their uni-level team. · You can invest $16,000 so that you get the second uni-level position. · You can invest $32,000 so that you get the third uni-level position. What is the cost of joining Mining Max? If you want to join this company as an affiliate, you will require to make a minimum investment of $3200. The maximum investment you can make to enjoy the full benefit is $96,000. Is Mining Max a legit business or a scam? There are so many gaps regarding this company, including the fact they claim they have partnered with South Korea for their mining facility. Another red flag is that this MLM company is based in the US, but there is no evidence showing that it is registered with SEC. That means the company can be shut down any time. On the other hand, the fact that you have to make money by recruiting affiliates constitute a pyramid scheme. What if recruitment slows down? You will end up losing money. My verdict is that you approach this company with extreme caution to avoid any frustrations when it gets shut down by SEC. I hope that my detailed research was helpful to you in this Mining Max Review. If you have any questions, please leave them below. Also, please be sure to share this article as it will help others to know about the Mining Max Company before investing any money. Click Here To Access This Same Training For Free! One of the best thing about this training is that you will be getting one-on-one support from the owners as you proceed with the courses. 3 Responses to Mining Max Review : Does It Work Or Is It A SCAM? I am not in the Mining Max Business. This is the system I use for online business.